1984 Islander MK II 30 With close to 1000 Islander 30's built, this is the most successful yacht in the Islander line. Her outstanding performance, easy handling, inherent beauty and luxurious accommodations, continue to meet the widespread approval in yachting circles everywhere. Major improvements have been incorporated in to this latest Islander 30, with state-of-the-art modular interior construction, that produces a rich interior of warm teak, beautiful upholstery and practical counter tops for real live aboard comfort. "Whispering Winds" has been lovingly maintained by the original owners and is in the water and ready to go sailing today! A new genoa was made in 2012 and new life lines were installed in 2014. All new large main cabin windows were installed this year! The bottom has been water barrier coated, for protection. The exterior bright work needs attention. You get more for your boating dollar in an Islander sailboat! 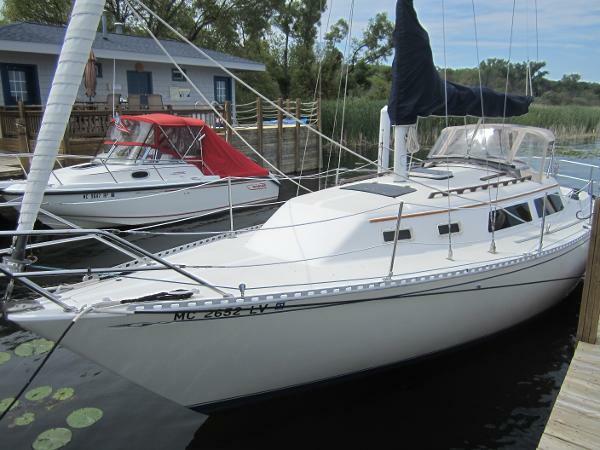 Islander 30 Mk II Sailboat for Sale. This boat was purchased with the intent of a complete restore, but time constraints have prevented completion. However, much of the restore was completed:- Every piece of deck hardware was removed and re-bedded to the highest standard (Holes drilled larger and filled with epoxy resin and re-drilled to prevent core rot/delamination). All deck hardware has also had 1/4" Aluminum backing plates installed. - Four New found metals Stainless steel portlights installed, Windows in main cabin replaced with thru-bolted lexan.- Bulk heads replaced with epoxy sealed marine grade plywood.- Sides of cabin reinforced with marine plywood epoxied to it. - All through-hulls removed and re-bedded.- New marine head and all new sanitation hose.- Yanmar 13 HP diesel completely serviced and in excellent working order. (installed raw sea water screen, Diesel fuel filter)- Upper Shrouds replaced (New turnbuckles, mechanical [not swage] fittings used). Both lower shrouds on hand and just need to be installed (including new turn buckles). - life-lines completely replaced.- All new running rigging. *******All running rigging and standing rigging replacement was done under advisement of Walden Rigging. - Deck painted with two-part epoxy paint.- Electrical System completely replaced with marine grade wiring.- Breaker panel installed, battery switch installed, inboard battery charger installed, All LED cabin lights installed, 12 volt plugs installed- Freshwater system overhauled, pressure water pump installed (4.3 GPM jabasco pump)- New exterior hand rail fabricated.- Winches serviced- Rudder removed and epoxied/barrier coated- 2 Deck mounted No-Leak Cowl vents installedINCLUDED: -Brand new stern rail mounted ALL stainless steel Bimini and an ALL stainless steel Dodger frame (no dodger, just frame)- Standard Horizon AIS equipped radio- Simrad Tiller Pilot- Depth Sounder- 2 AGM house batteries, 1 AGM starting battery- Jib ( with aluminum Schaeffer roller furling) and Main Sail (with sail cover) - interior cushions ( poor condition, need heavy cleaning and/or replacement covers)- AnchorWhat needs to be done: Our restoration came to a stand still once we got to the cosmetic interior. The interior needs a heavy cleaning, replacement counter top for the galley, a headliner installed, and general interior finish work.With that said, this boat could be splashed and sailed away with no problem what-so-ever (Haul-in is payed for). Remaining work to be done is 95% cosmetic. Boat is located on land at Bowleys Marina in Middle River, MD. Any questions at all please feel free to ask! ***Buyer is responsible for pick up and delivery. 500$ Deposit due with-in 24 hours of auctions end. Full payment required with-in 5 business days. Powered by eBay Turbo ListerThe free listing tool. List your items fast and easy and manage your active items.